Last weekend a friend of mine thought one of his favorite tools was stolen, in broad daylight, from his front yard. “Are you saying you think he stole it, or you know for sure?” His wife replied. I’ve known my friend for over twenty years, and like all of us, he has some flaws. At times he attributes negative occurrences to the evil intentions and choices of others, without any apparent evidence. As he told me the story, I had already figured out the ending. He would find the pliers in the dirt where he been working and would have to call the business owner back and eat humble pie. He grabbed his phone, dialed the number. Surprisingly, the owner of the waste disposal business answered. As you might imagine, he was taken aback by the accusation of theft, but he agreed to investigate. Five minutes after the phone call, a car pulled up. A man got out and slowly walked up to the front door. In his hand were the blue pliers. My friend was right; the flyer guy had stolen them. He would have been justified calling the thief’s boss and demanding his firing, blowing up the company on Facebook, and even filing a police report. What decision would he make? Leaders are defined by the quality of the decisions they make. In this article, we’ll take a look at three things: how you can prepare before deciding, how you communicate your decision (particularly in a conflict situation), and how you follow up after you’ve chosen. Let’s first explore how you prepare for a decision. These are fundamental ethical boundaries that drive his or her behavior. 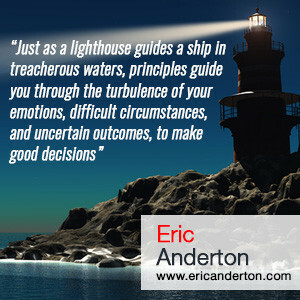 Just as a lighthouse guides a ship in treacherous waters, principles guide you through the turbulence of your emotions, difficult circumstances, and uncertain outcomes, to make good decisions. How do I want to show up every day, so that I have a good conscience about my behavior? Answer them honestly, and they’ll guide you when you are deciding what to do, and give you confidence in the choices you make. Principles can be applied individually and to your company. Recently one of my construction clients decided to invest in technical training for his labor force. One of the principles driving his company is delivering high-quality work. The training required a significant investment of money and took his guys out of the field for quite a bit of time, but because he was clear in his principles he was confident in his decision. He was delighted after the training to see rework on his projects decline and profit increase. When you communicate a decision, you risk rejection, disagreement and personal attack. 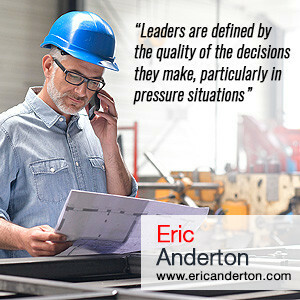 This often results in leaders putting off tough decisions or resorting to a dictatorial style, that undermines their credibility. If your people push back on a decision, assume that they have good reasons. Give them room to express their disagreements and seek clarity. Maintain your calm, listen carefully to their concerns, and stay grounded on the principles that led you when you crafted the decision. A healthy humility leads to a willingness to be flexible. How many decisions have you made which have turned out, either immediately or sometime afterward, to be incorrect? You don’t know everything, and you cannot foresee every outcome. After you’ve decided, set up a follow-up process, appropriate to the scope of the decision, to check on results. Do this daily, weekly, or at the most monthly. Confidence should mark the decisions you make, and when you exhibit flexibility following a choice, and a willingness to admit mistakes, you’ll create faith in your people as they learn that you are able, when the outcomes dictate, to change your mind. Don’t get discouraged by your mistakes. 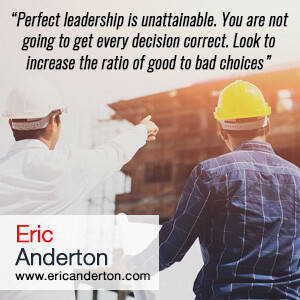 Perfect leadership is unattainable. You are not going to get every decision correct; look to increase the ratio of good to bad choices. To do this spend time thinking about the principles that drive your choices, be willing to bear the burden of decision making, and remain afterwards, knowing that you may be wrong, and you can always adjust your decision. My friend was glad to get back his blue pliers. Head bent, the flyer guy sheepishly apologized. Instead of taking further action my friend quietly admonished him not to do it again and went back to fixing his irrigation. Yes, my buddy is naturally skeptical of others, but deeper values drive his life. One of those is a willingness to forgive others. This principle inspired his decision to pardon the flyer guy. How to define your principles and choices. The Leadership Dashboard is a simple tool that covers eight areas. The first three are Vision, Mission, and Values. If you take the time to think about these for yourself, and your company, you’ll be able to clarify the principles that drive your decisions. The rest of the dashboard will help you to flesh out strategic and tactical choices you need to make in the next 12 months. 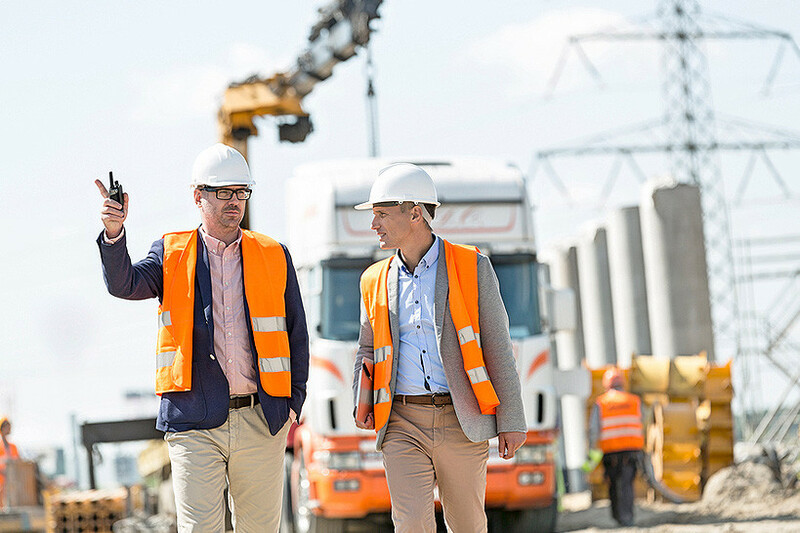 Once you’ve got your principles down, you’ll be able to craft and communicate these decisions with calm confidence, while maintaining the flexibility that is the hallmark of effective leadership. To get started today, just click this link and download your Dashboard.